The new Uncle Louie G on Bay Street offers 64 different flavors of ice-cream and Italian ices. 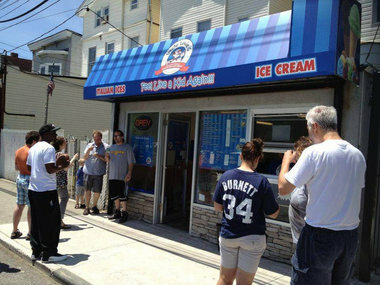 STATEN ISLAND, N.Y. — Feel Like a Kid Again, the new Uncle Louie G’s ice-cream shop on Bay Street, has got to be doing a bang-up business these days, as summer has swung into high gear. The franchisee is John Basciano of Great Kills who looked around at the changes that appear to be in the works for St. George and Stapleton, and decided that Bay Street needed more diversity. Not in terms of ethnicity, but in terms of retail and food options. Basciano is joining a growing group of entrepreneurs who are taking a chance that people who live and work nearby — in communities like St. George, Tompkinsville and, of course, Stapleton — are looking for different shopping and quick-stop options other than gas station mini-marts and drugstores. A Key Food recently opened on the corner of Victory Boulevard and Bay Street in Tompkinsville, giving locals a full-service grocery; a liquor store has opened across from Tompkins Park in Tompkinsville, and not too far away, in St. George, Honor Wines is making a go at offering more unusual selections. Basciano said he can envision a “mini-Hoboken,” if the trend gains steam — which he is hoping it will as The Wheel and a designer outlet shopping mall go in, as promised, and as the Ironstate development of apartments proceeds apace at the former Navy Homeport.